When Hamilton was a little boy, his parents were missionaries in Bangkok, Thailand. His father helped set up a radiology department in a mission hospital. The family lived on a compound behind the hospital. The three or so years they lived in Thailand in the early 1960’s were some of their fondest family memories. Life was easy and simple on the compound with lots of friends and freedom to explore. They came home with many treasures and our house still has the influence of those halcyon days with the many artifacts of an exotic culture far from Tennessee. 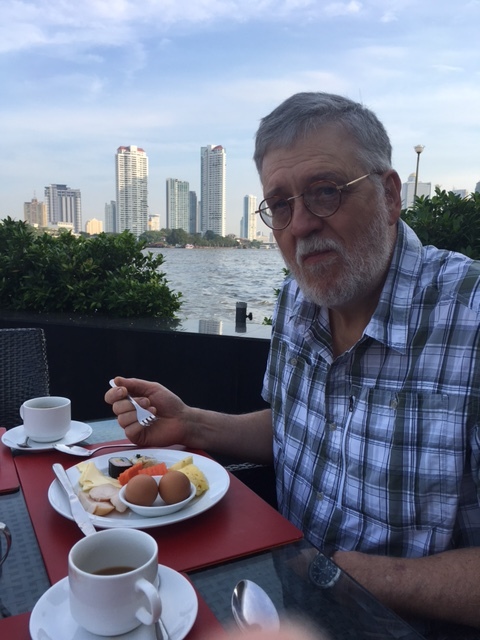 Hamilton was old enough to remember so much of life in Bangkok and always wanted to go back and see the country that made his family so happy and really informed the rest of their lives. This January, Hamilton and I had the opportunity to make that pilgrimage to remember that life-changing experience. His father has passed away and his mother can no longer remember but that family experience over 50 years ago still remains such an important part of their legacy. I was very happy to go to Thailand, I have never been to Asia and I wanted to relive those memories with Hamilton and make new memories for the two of us and I wanted to visit the great golden temples of this magical land. Thailand is a Buddhist country and less then 5% of the population practice other religions. Let me tell you the Buddha is everywhere and infuses every aspect of the culture. They practice Theravada Buddhism which is the dominate branch of Buddhism in Southeast Asia. Thais are a happy, easy-going people who live their Buddhist ideals: gentleness, compassion and kindness. I have studied Buddhism for many years and have incorporated these principles and values in my life but the main Buddhism in the United States is Tibetan or Zen and so I was unfamiliar with Theravada. And as much as I love and venerate the Buddha, I will be the first to admit I don’t know the rituals or the traditional words but I do know my honor and respect for the Buddha is enough for it is in my heart that deep devotion lies. 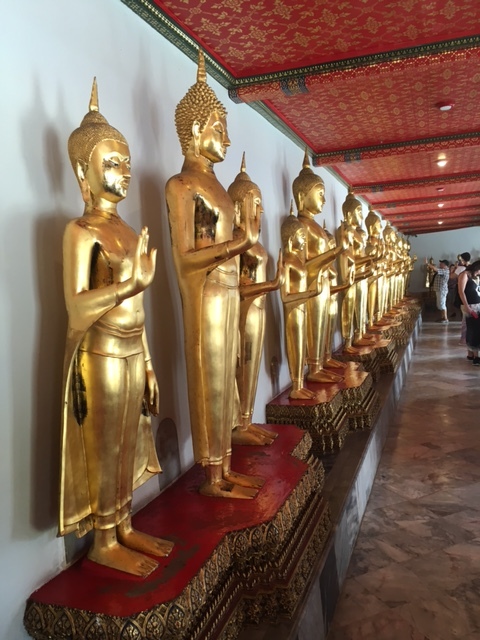 We started our visit to Thailand with a traditional tour, I wanted to ease into Asia with lots of hand-holding from a guide and a bus. This was an easy and economical way to get started and then the last few days of our trip we had the confidence to be on our own to see extra things of interest to both of us. Our first stop was Wat (temple) Pho the oldest temple in Bangkok. 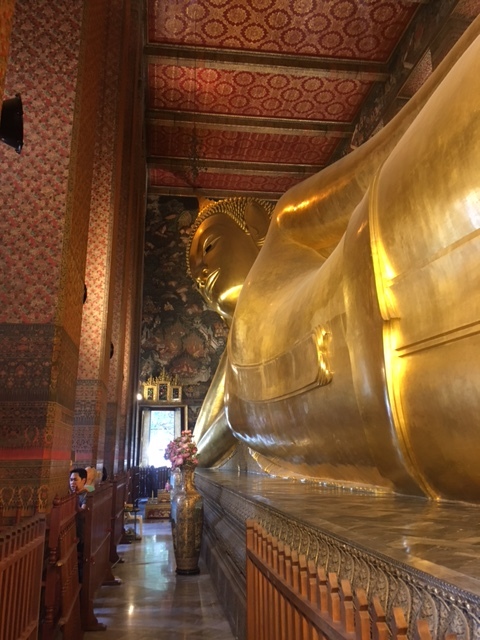 This is one of the most visited of the nearly 400 temples in Bangkok and is the home to the 150 foot long and 45 foot high reclining Buddha. The large building is just big enough for this Buddha. 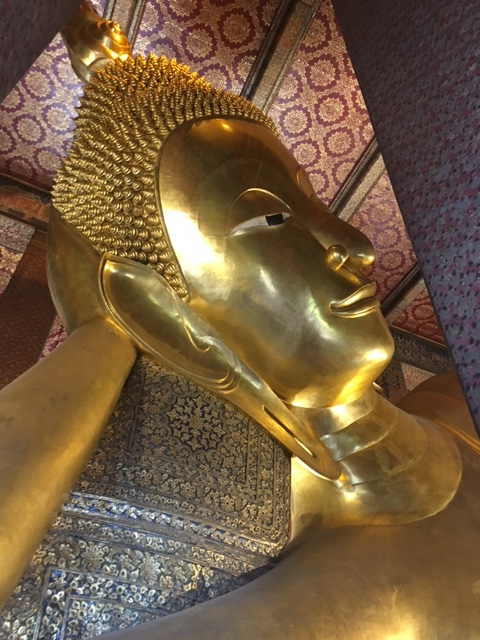 The reclining Buddha represents the Buddha just before death and is connected with Tuesday. So if you are born on a Tuesday, this is your Buddha which makes it my Buddha. This first Buddha of the trip took my breath away and remains my favorite. The Buddha is laying on his side with his eyes half closed and is serene and ready for death and entry into Nirvana. I slowly walked along the long body to the feet. On the bottoms of his feet are pearl inlays depicting 108 auspicious symbols of the Buddha. Along his back is a place to buy small coins and along the wall are 108 bronze bowls. I quickly figured out that those coins went into the bowls as a blessing for good fortune and to help maintain the temple. I walked along dropping a coin in each bowl, grateful for this opportunity to come to the land where the Buddha is honored for his enlightenment. This large temple complex was an early university, teaching science and medicine and had a massage school. There is still a building with drawings used to teach this healing art that is such a part of Thai culture. 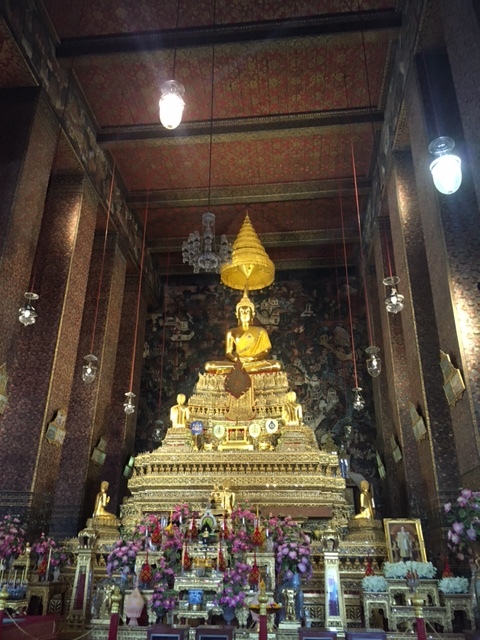 The holiest prayer room at the temple is call the ubosot and at Wat Pho a beautiful gold meditating Buddha sits high on an alter. Several monks came in and were taking selfies with their iphones. It made me feel less like a tourist that even the monks were taking pictures before settling down to meditate. It was a beautiful day and I was so happy and grateful for the opportunity to visit this enchanting country. That afternoon I took a long and deep nap, exhausted from our long flights but full of dreams of the land of the golden Buddhas. 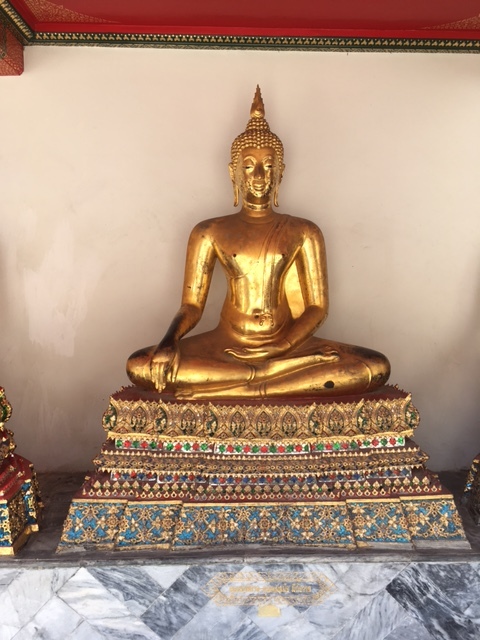 This entry was posted in Asia, Buddhism, Temples by theperpetualpilgrim. Bookmark the permalink.